One thing I picked up from my teaching practicum is gathering student feedback. I made questionnaires for the students to fill out and that helped me recognize areas to improve on. 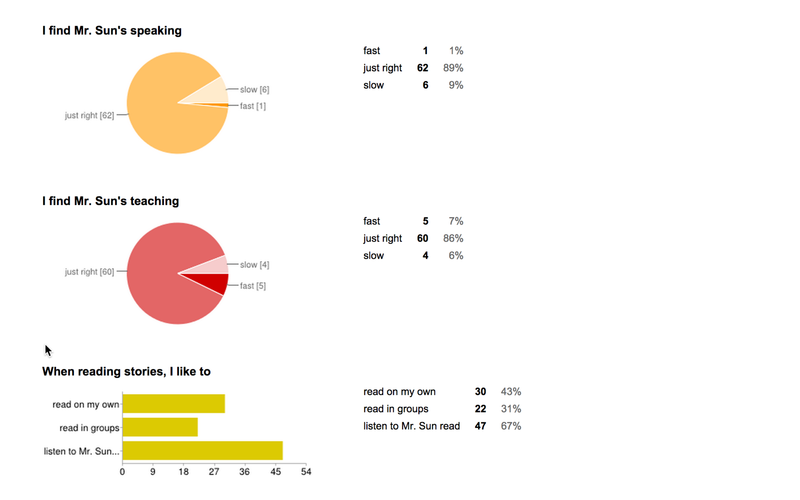 One major feedback from my very first questionnaire was a quarter of the students felt my Math lessons were too rushed. I adjusted accordingly and it worked out for everyone. 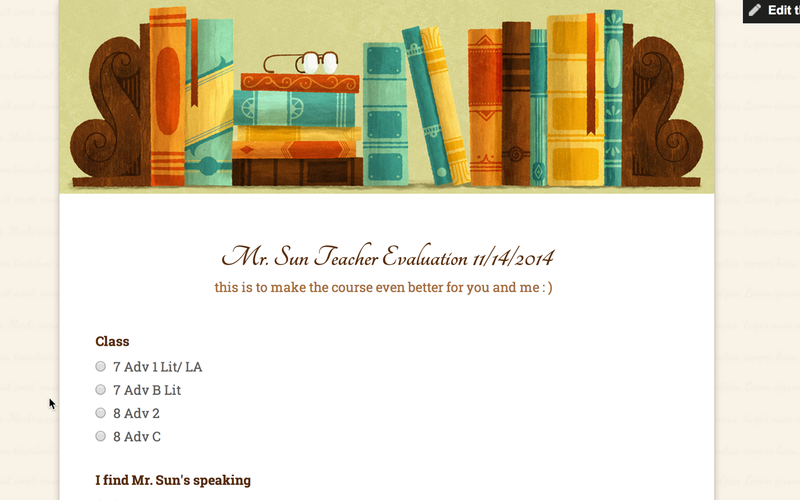 Last year I also did an evaluation before Winter Break. I found out a student had felt left out and ignored by the rest of the class. So I integrated her into more pair activities the second semester. She made some friends and seemed much happier. The student feedback was an unique opportunity for me to learn something I wouldn’t have known otherwise. The results are quite encouraging. The students feel I’m teaching at a good pace and the classes aren’t too boring. They like listening to me read more than they like to read on their own. Pat on the back, Mr. Sun = ). “Teacher is nice, free time is fun, sofa and carpet are comfortable, everythings are incomprehensible.” – I hope the student meant everything is comprehensible! “Boys can be more clam (calm)” -> totally agree! “I don’t like the pig because they are cute.” -> I have no idea what this is about.